The premier app for PE Teachers,allowing you to sort through and discover minor games for use in your practical sessions. 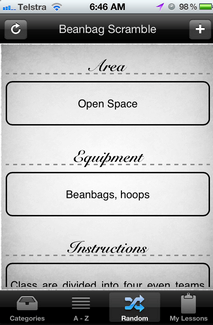 You can even add your own games and game categories to build an enormous mobile library. Another highly useful video analysis tool for coaches and PE Teachers on the go. Use the built in pen and drawing tools to emphasise aspects of a given performance during review and send them via email or save to the camera roll. One of the coolest features is the ability to send a video direct to another iOS device via Wifi. Snapguide is a free tool that allows you to create step by step guides for whatever you like. With this app it is a breeze to add text, photos and even videos to the guide. Phys Ed classes could easily use this to build up step by step guides to sporting skills, game situations and much more. You can even share the finished guides via your favourite social networks. This great app is allows you to capture frame by frame images of sports activities and then play them back in either slow of faster than normal speeds. A perfect addition to any skill development activities or video analysis/instant feedback task. A free video analysis app that allows users to easily explore skills on the go. Comes in either an iPhone or iPad app, with the later providing the ability to conduct side by side analysis with syncing. Something I have really wanted to see in an app. If your an Australian Rules coach you absolutely must get this app for your iPad. Not only can you setup your teams, but you can gather statistics to strengthen your coaching. Full match reports can be emailed as soon as the game completes. A wonderfully useful app. This great little free iPad app, allows students to track and record their physical activity and nutrition via an engaging interface. Provides many opportunities to discuss hydration, physical activity guidelines and many other health related areas. Check out the other top app lists here – Part 1 – Part 2 – Part 3 – Part 4– Part 5 – Part 6 – Part 7 – Part 8 – Part 9 – Part 10 – Part 11 or grab the PE Apps app for a great one stop collection of the best PE apps. Good day, Mr. Robinson. I hope you are doing well! I just came back to your blog to read over some more posts. A few questions came to mind: How do you find these apps? Where do you look for them? How do you know where to look? Is it just one website? Do you have a database? I’m really interested, besides me reviewing your posts from Sept. 2008, I would like to conduct my own little search to get used to doing it. I am looking forward to hearing back from you soon! Oh, and I am supposed to be leaving a post this week ( no later than today, Sunday, April 22) about what your posts have been saying. In closing, thank you for all the work you do! You are truly an awesome man. I was just reading over your blog and came across your post, Top Apps for PE teachers-Part 13. These are not only great for PE teachers but for all teachers and even parents. I think it is important for kids to stay active and healthy. You have provided a list of some great apps and I can’t wait to explore each one of them. I myself like to run and use the runkeeper app you mentioned. I have also usedmyfitnesspal which I also like very much. It has a website that allows you to track your information online and has a place where you can interactive and get support from other users. There are so ways to use technology to combine fitness in with education. It is important as teachers we find ways to create lifelong learners and for those students to practice lifelong fitness. Thank you for providing some great resources and I look forward to reading your future blog post.